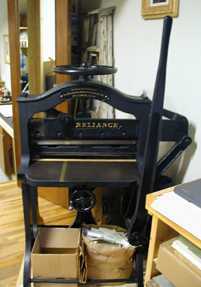 A circa 1895 Reliance guillotine made in Chicago. Will handle paper 25.5 inches wide with a depth of 26 inches. A more modern cutter would probably be nice as most commercial sheets come in 26x40" now but since I don't use much commercially made paper stock I'll stick with the beauty over functionality. 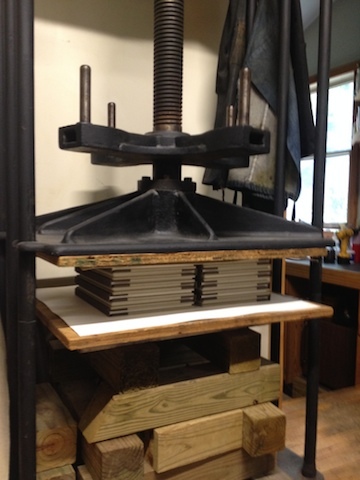 Standing press, platen size, 20 x 28 inches with a daylight of 58 inches. Made in 1897 by G.H. Sanborn & Co. in New York, it stands over six feet tall. 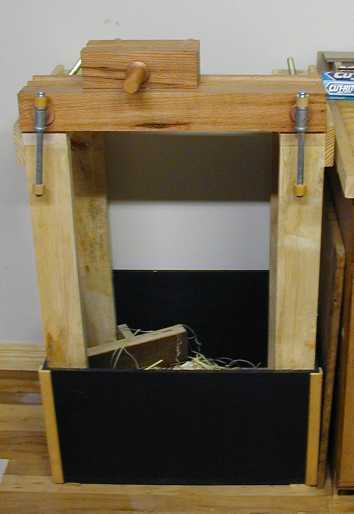 Shop built lying press and plough. The plough glides through a dovetail notch on the back cheek and the blade is from an old block plane, reshaped to the proper angle and pitch. It has a opening of 16 inches between screws and a 14 inch throat. 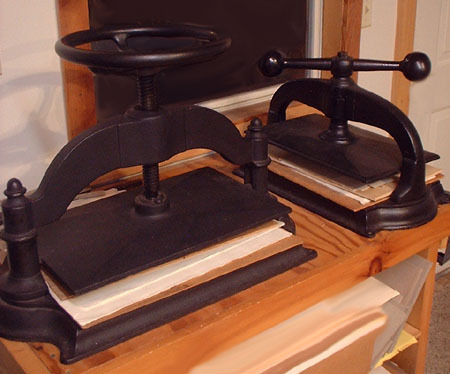 A couple of the book presses, the big one has a platen of 12 x 18 inches. Papers and boards are placed in these after gluing to ensure a flat even adhesion of surfaces. There are a couple more of these floating around the studio as well when production binding gets intense. 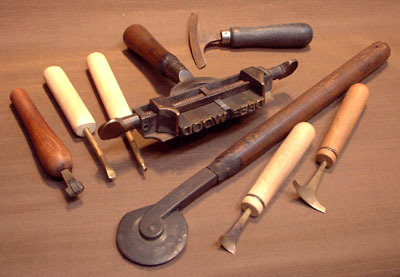 These are just some of the tools which are heated on a modified hot plate and used to manipulate fine book leather and add linear or decorative elements either left "blind" or with the use of foils. They also prepare the surface for techniques such as gold leafing. 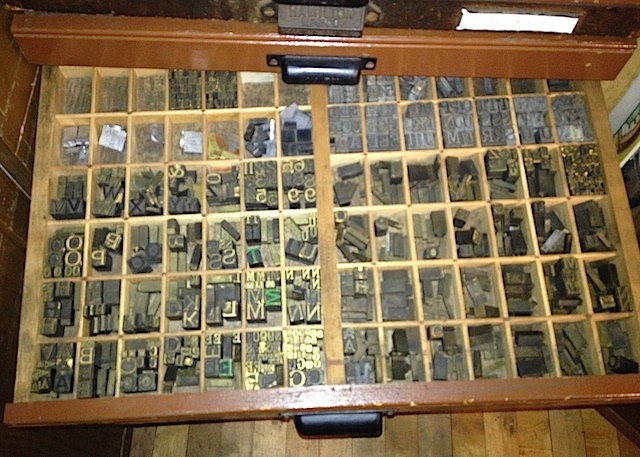 All of the working surfaces are made of brass, even in this case, the type. 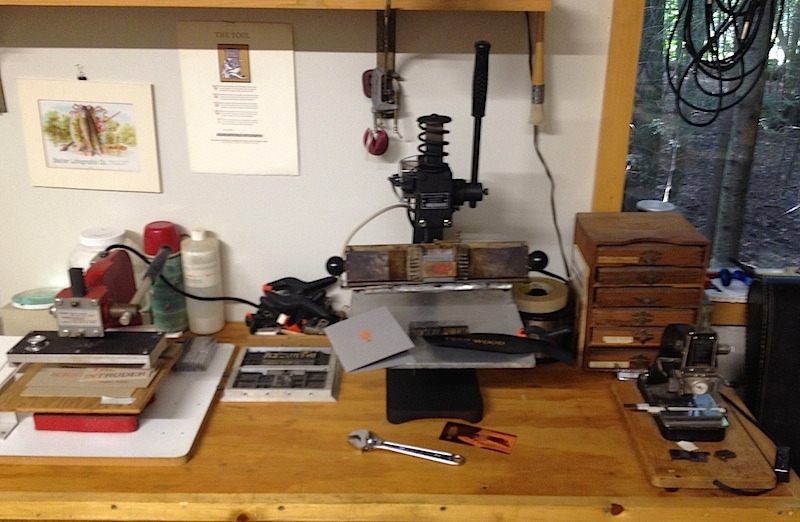 Some of the foil stamping machines. From left to right, a Gold Magic with 3x7" chases, a Kwik Print Model 55 with a 3x9" multi-line type holder and a small Kingsley peanut that heats up quick and will do a 2" line of 18pt type. These machines use foils to transfer the metallic or other pigmented colors onto leather/paper/cloth/plexiglas by use of both heat and pressure. Just one of the cases of brass and zinc type used do the beautiful titles you see on the covers and spines of books. 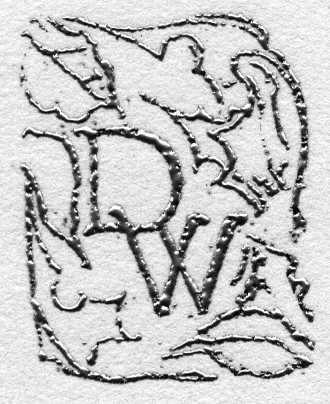 While it is possible to use regular foundry type for this sort of work the harder metals last longer and are less destructive to the impression surface of the type.